Acknowledged author wrote CRIMINAL LAW & ITS PROCESSES comprising 1440 pages back in 2016. Textbook and etextbook are published under ISBN 1454873809 and 9781454873808. 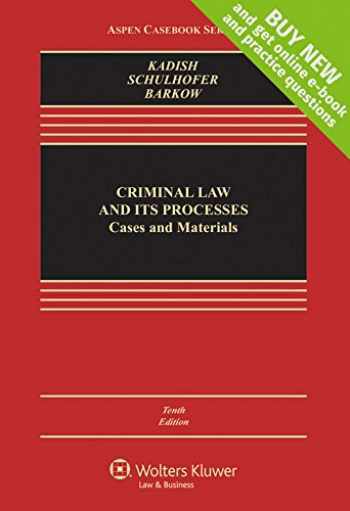 Since then CRIMINAL LAW & ITS PROCESSES textbook received total rating of 3.5 stars and was available to sell back to BooksRun online for the top buyback price of $62.11 or rent at the marketplace. Buy a new version of this Connected Casebook and receive ACCESS to the online e-book, practice questions from your favorite study aids, and an outline tool on CasebookConnect, the all in one learning solution for law school students. CasebookConnect offers you what you need most to be successful in your law school classes portability, meaningful feedback, and greater efficiency. From a preeminent authorship team, Criminal Law and its Processes: Cases and Materials, Tenth Edition, continues in the tradition of its best-selling predecessors by providing students not only with a cohesive policy framework through which they can understand and examine the use of criminal laws as a means for social control but also analytic tools to understand and apply important criminal law doctrines. Instead of presenting the elements of various crimes in a disjointed fashion, Criminal Law and its Processes: Cases and Materials focuses on having students develop a nuanced understanding of the underlying principles, rules, and policy rationales that inform all criminal laws. A cases-and-notes pedagogy along with scholarly excerpts, questions, and notes, provides students with a rich foundation for not only the academic examination of criminal laws but also the application of the law to real-world scenarios. Features: Retains prior edition s principal cases and Notes and Questions approach to explain and probe fundamental concepts. Notes updated to incorporate contemporary cases and recent news touching on criminal law. Inclusion of additional preeminent cases in the field of criminal law, including: Yates v. United States, 135 S. Ct. 1074, (Supreme Court application of common statutory interpretation techniques and the rule of lenity) Rosamond v. United States, 134 S. Ct. 1240, (Supreme Court examination of accomplice liability) Perry v. Florida (examination of the agreement requirement for conspiracy through the lens of a Florida sexual battery offense). Theft (chapter 9) substantially revised to include new principal case dealing with trespassers takers in the credit card context. Expanded discussion of: mass incarceration and prosecutorial/law enforcement discretion; and, the intersections between race and criminal law CasebookConnect features: ONLINE E-BOOK Law school comes with a lot of reading, so access your enhanced e-book anytime, anywhere to keep up with your coursework. Highlight, take notes in the margins, and search the full text to quickly find coverage of legal topics. PRACTICE QUESTIONS Quiz yourself before class and prep for your exam in the Study Center. Practice questions from Examples & Explanations, Emanuel Law Outlines, Emanuel Law in a Flash flashcards, and other best-selling study aid series help you study for exams while tracking your strengths and weaknesses to help optimize your study time. OUTLINE TOOL Most professors will tell you that starting your outline early is key to being successful in your law school classes. The Outline Tool automatically populates your notes and highlights from the e-book into an editable format to accelerate your outline creation and increase study time later in the semester.